Patent Reform and Best Mode: A Signal to the Patent Office or a Step Toward Elimination? 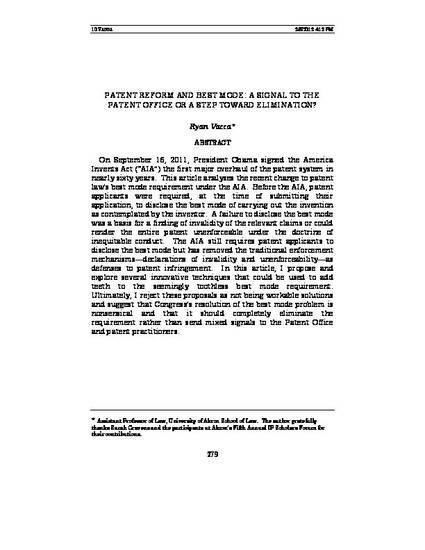 On September 16, 2011, President Obama signed the America Invents Act (AIA), the first major overhaul of the patent system in nearly sixty years. This article analyzes the recent change to patent law's best mode requirement under the AIA. Before the AIA, patent applicants were required, at the time of submitting their application, to disclose the best mode of carrying out the invention as contemplated by the inventor. A failure to disclose the best mode was a basis for a finding of invalidity of the relevant claims or could render the entire patent unenforceable under the doctrine of inequitable conduct. The AIA still requires patent applicants to disclose the best mode, but has removed the traditional enforcement mechanisms – declarations of invalidity and unenforceability – as defenses to patent infringement. In this article, I propose and explore a couple innovative techniques that could be used to add teeth to the seemingly toothless best mode requirement. Ultimately, I reject these proposals as not being workable solutions and suggest that Congress's resolution of the best mode problem is nonsensical and that it should completely eliminate the requirement rather than sending mixed signals to the Patent Office and patent practitioners. Ryan G. Vacca,Patent Reform and Best Mode: A Signal to the Patent Office or a Step Toward Elimination?, 75 Albany Law Review 279 (2012).